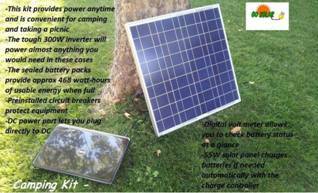 This is our portable camping size kit that is self-contained and complete, and comes ready to put in the sun for portable power. It has circuit breaker built in for protection. It has a DC power port and comes with USB adapters for charging the most common devices. It’s meant for setting in a convenient location (hopefully in the sun) when camping or picnicking or whenever it is needed, and providing a small power source that automatically recharges itself. No assembly required. GreenerEnergy.ca cannot take responsibility for the implementation of these kits by the installer and offers them as a recommendation. Please observe NEC and local codes. World Historical Climate & Weather Data - Installations - Need Help Selecting Components? Contact Us!